Do You Know Your Limiting Beliefs? Do Know Your Limiting Beliefs? "If a man harbors any sort of fear, it percolates through all his thinking, damages his personality, makes him a landlord to a ghost." Many writers talk about Limiting Beliefs and tell you of ways to eliminate them. But to do that don’t you have to be able to recognize them? And is it really that easy to recognize them? Limiting beliefs are very subtle and difficult to recognize because they exist underneath our conscious thoughts, beneath our everyday mind. A certain belief becomes embedded in your mind and thereafter becomes a part of your filter, your belief system. 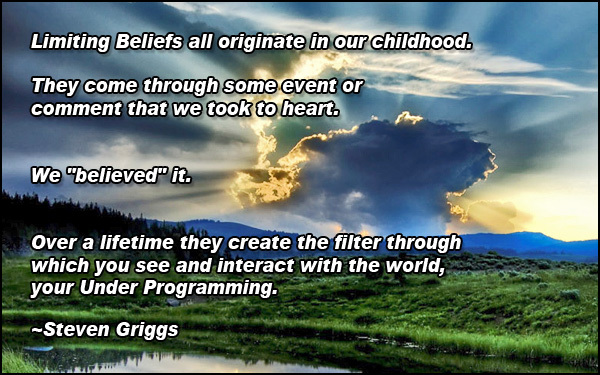 Over a lifetime they create the filter through which you see and interact with the world, your Under Programming. Limiting Beliefs all originate in our childhood. They come through some event or comment that we took to heart. For whatever reason we applied an emotional charge to the event and it became embedded in our mind. We "believed" it. As children we were constantly learning about this world, seeking to understand and fill in the gaps in our understanding. To feel solid we sought answers. Sometimes the lessons or answers we received came from these emotionally charged events and became our Limiting Beliefs. Another belief could be created from hearing your parents or others talking negatively about money or wealth. “Money doesn't grow on trees!” “Money isn't everything!” “Do you think I’m made of money?” You may therefore hold a negative opinion of money, a belief that money is bad. Our parents can’t be blamed for any of this. They were the result of their programing and their parents were the result of their programing…. . It’s a vicious cycle. But the final result is a compilation of all our limiting beliefs to form what I call our “Comfort Band”. This is a band or range of comfort that we each live within. It is much like a thermostat setting, you have a high and a low and we operate within that range. Sometimes you will range down towards the lower setting and sometimes bump up against the higher setting but you will always stay within the range. Not higher, not lower. Have you ever noticed how many lottery winners seem to lose it all and end up right back where they started? That’s why some people have more money than others. Their Comfort Bands allow for greater financial success, while some of us don’t feel comfortable being that successful. It’s not based on intelligence, luck, education, connections or anything else for that matter. It is all based on our Under Programing and that sets the limits of our “Comfort Band”. How do you uncover a limiting belief? First, you need to listen to your self-talk and pay attention to those quiet little comments you make to yourself. Listen for anything you say to yourself that is a negative statement, a justification or rationalization. “I don’t know enough about (fill in the blank) to be successful”. “I can’t do that because (fill in the blank)”. “I’ve always been unlucky”. “I don’t know what I’d do with that kind of money.” It goes on and on. These are all the symptoms of your underlying Limiting Beliefs. There are many, many variations of Limiting Beliefs but basically they all boil down to having low self-esteem. You can also look at your current circumstances to get a picture of your comfort settings. How does your life feel? Are you where you want to be? Are you comfortable? Do you day dream of having more? Do you fear having less? How would it feel to drive a Maserati or a Lamborghini? How would it feel to live in an apartment in Trump Tower? Or did some other thoughts come up? I’m not saying that you necessarily want a Maserati or Lamborghini, or a Trump Tower apartment, I know my Comfort Band doesn't want those, it’s just not me. The point is, by paying attention to yourself you can begin to see when you bump up against your band settings. And by learning your settings you can begin to understand who you are. By continuing to understand who you are you can begin the process of uncovering the underlying beliefs that you created many years ago, the Limiting Beliefs that form your “Comfort Band”. The next step: Getting clear on what you really want.